The EURGBP pair has rallied sharply from the lows early this month and is now sitting around the 0.86 handle. Binary Options Brokers research suggests that hopes for a tightening of monetary policy at the European Central Bank and expectations for a hard Brexit negotiations process are behind the recent rally in the currency pair. Both the ECB meeting and the UK’s general election will take place on June 8 and traders will focus on these two events as a guide for trading the EURGBP pair. The aforementioned fundamentals have not changed much and expectations at the moment are for the uptrend in EURGBP to resume sooner or later on the back of the same drivers. However, due to the significance of these 2 events, there is always scope for a misalignment in expectations and consequently a sharp reversal. As such, a good strategy is to trade the pair and these two events via binary options through a regulated binary options broker. It’s always important to remember that with binary options you can not lose more than you invested and you can risk the exact amount you specify, unlike the spot market where sudden excessive volatility can lead to many large and unforeseen losses. On the basis of the fundamental outlook, we show this 4-hour chart and the best places to initiate new positions in the direction of the uptrend. The first support area is the previous high at 0.8615. If this level is broken to the downside then the next in line is the Fibonacci support zone between 0.8560 and 0.8580. 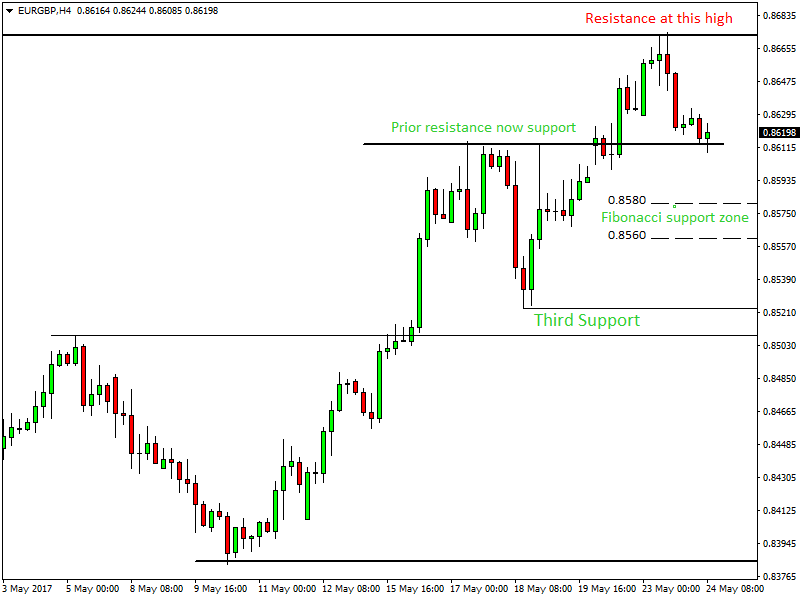 The third support area to the downside is 0.85 – 0.8520. Remember, the high at 0.8670 is resistance and trading the pair with a registered binary options broker can markedly reduce your risk in trading the Forex market.